John completed his sentence and walked out of the Taft Prison Camp early this morning. According to national reports, he was one of 2,000 who returned to society from American jails and prisons each day. Adjusting to the world outside would not be easy. During the 15-plus years that John served, he endured the family struggles that plague many prisoners. His wife left him. The teenage children that John left behind had grown into adults with families of their own. He suffered feelings of abandonment from society. Those troubles led John into bouts of periodic depression and apathy. He didn’t exercise much, and the starchy prison diet brought on morbid obesity. He was 52-years-old and walking out of prison into a world of hardship. John told me about his early adjustment. He was a Mexican-American who came from a blue-collar background, and he dropped out of high school in his sophomore year. “School wasn’t never for me,” he said. Without much of an education, John picked up work as an unskilled laborer at first. He mowed lawns, he dug ditches, he hauled garbage from construction sites. In his mid-20s, John found a job in a mechanic’s shop, and he worked for several years changing tires. The pay was not great, and John wanted more. Dissatisfied with his earning potential, he succumbed to temptation when a drug dealer offered John an opportunity to earn a few thousand dollars by transporting methamphetamine. That poor judgment led to John’s conviction and lengthy prison term. John was 37-years-old at the start of his term, and the sentence he received extinguished hope. His imprisonment burdened his wife with financial hardship and necessitated that she bring up two young teenage boys on her own. They were evicted from their home. John had created a mess without an apparent end, and, when his family deserted him, he chose to forget about the outside world. Without a prior criminal record, John served the first eight years of his sentence in low-security prisons. Nothing mattered; he didn’t set goals. John said that he passed his time running with the fellas, “the homies.” That meant a directionless adjustment, presiding over the poker games, hustling contraband, and doing whatever was convenient to move from one day into the next. Frequent disputes led John to spend his share of time in segregation. 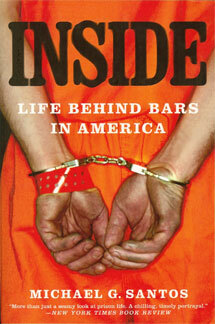 “The hole’s just another part of the prison.” His perspective was that of many long-term prisoners. When John reached his mid-40s, administrators transferred him to the Taft Federal Prison Camp. In the camp, John said that he changed his adjustment. He began participating in community-service projects. For the final five years of his term, John worked daily on road crews picking up debris from the highway; he worked tending to local fields and parks; he provided needed labor for church and charity groups. The work brought him more sense of purpose, he said. The community service may have eased John’s final years in prison, but it didn’t prepare him for the colossal challenges that he was about to confront in the real world. John said he appreciated the generous lunches he ate while working on the community projects, and he took pride in the Certificates of Appreciation he received. Staff members considered John a model inmate. As of this morning, however, John was an inmate no longer. He returned to Long Beach, where unemployment rates exceeded 10 percent for citizens without criminal records. Overweight Hispanic men in their 50s, with substandard education levels, lacking a work history, and ties to society, would face significantly higher levels of unemployment. As a released prisoner, John was about to encounter the worst job market in his lifetime. At Taft Camp, signs abound touting the administration’s mission of preparing offenders for re-entry. In a few hours, unfortunately, I think John will discover just how unprepared he is to meet the challenges of a successful transition to society. He doesn’t have financial resources, prospects for employment, housing, a vehicle, insurance, or even clothes to wear. His immersion into the prison culture provided John with his reserved seat in the television room, respect from the homies, clothing, shelter, and food, but that era was over. Living as a model inmate, in the end, has set John up for extreme hardship that begins now. What could administrators do differently to prepare offenders for re-entry more effectively? From my perspective, the answers are obvious. Academic research presents compelling evidence that community ties and employment represent the most effective determinants for success upon release from prison. Accordingly, if administrators truly wanted to prepare offenders for re-entry, they would facilitate programs that help prisoners build stronger community ties and employment prospects. John served the final seven years of his sentence in a minimum-security prison on the honor system. Fences did not confine him. If administrators deemed John trustworthy enough to travel into the community daily, then he ought to have been trustworthy enough to furlough his community on a basis sufficient enough for him to have built stronger community ties. If he was trustworthy enough to volunteer regularly on community projects, then he should have been trustworthy enough to have completed a community-based vocational or apprenticeship program. Had he earned journeyman certification in a trade, John could have transitioned from prison into meaningful employment – or at least he would have had better prospects for employment. Senator Jim Webb has called our nation’s prison system a national disgrace. I know that it’s a disgrace because I’ve been confined in various prisons of every security level since 1987. Administrators in prisons post platitudes about the importance of preparing offenders for re-entry, though my experience is that they feel cynical about those who pursue meaningful and sustained preparations for release. During my confinement I’ve kept a record free of disciplinary infractions. I’ve earned an undergraduate and a graduate degree. I’ve published several books, designed and taught several classes, contributed to programs inside and beyond prison boundaries. This deliberate adjustment has helped me build a thriving network of national support. Yet prison administrators at Taft Camp say I have not done enough to merit 13 days in extra good time for which my sentence can allow me to absorb. Prisons extinguish hope, and they do so brilliantly.